Worms, rabbits and two beautiful cows | Twende pamoja! Today was a bit of a fun day out of the office for me. One of those days where I very much like being a project fundraiser because it means you get to go see all sorts of inspiring things in the name of research and partnership building! Real Impact is the solution that grew out of the challenges faced by it’s parent company, Real IPM, which sells environmentally-friendly pesticide solutions to farmers. With 140 employees, often from low income backgrounds and suffering from poor health including high rates of HIV and AIDS, the company wanted to be able to offer its team a healthy, nutritious meal every day. So using the land it had going spare, it set to work. The first step was to start growing the vegetables and fruit needed to stock the kitchen for the staff canteen. The second step was to make a rich compost so the fruit and veg would grow large and luscious. 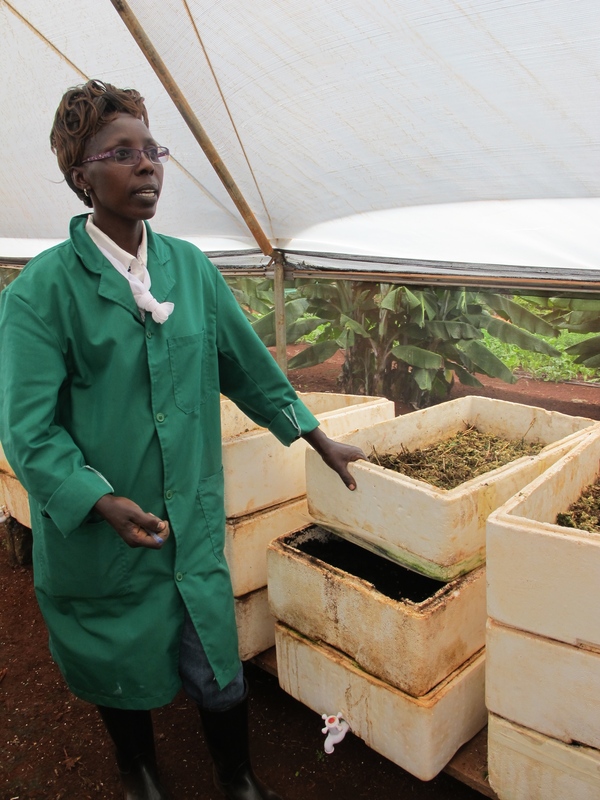 In come the worms to munch on the organic waste from the shamba (farm) and turn it into a powerful liquid fertiliser. The third step was to identify a sustainable source of meat to balance the diet with protein. In come the bunnies… At this point I must admit as a vegetarian I couldn’t help but look at these beautiful bunnies and feel sorry for them. But Julia, the excellent and incredibly knowledgeable farm manager, pointed out quite rightly that they are an fantastic source of protein and reproduce very fast i.e. there would be another cute bunny along very shortly! The fourth step was to find a sustainable energy source for powering the cookers in the kitchen. In come the two cows who now provide a fantastic source of bio-gas. The final step is to teach others. And that’s where we come in. The YMCA branch in Thika has a wealth of land that is currently a little underused. The plan is for Real Impact to train up our youth members so that they can transform the land at the branch and generate their own income from the produce. Starting with these vertical growing bags that maximise the use of space. I can’t wait to see how it goes! This is a really cool project. Nice to see a woman in charge! Be interesting to learn about some of the other initiatives you see.